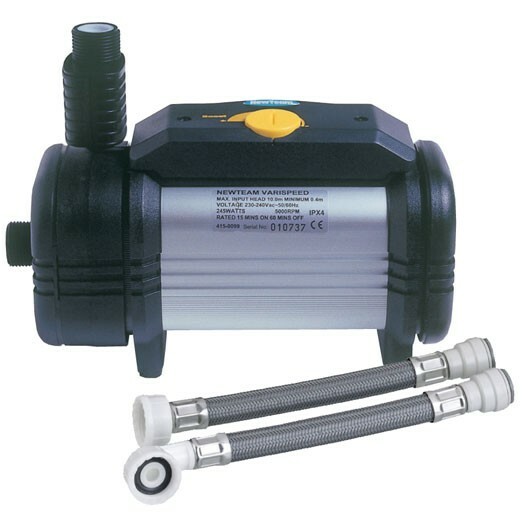 This product has been discontinued the ideal replacement for this product is the 2.0 bar Single Shower Pump. The New Team Varispeed Si pump is a single impeller pump that is designed to boost the hot water supplies to your shower. This New Team pump has been discontinued. Please see the Bristan 2.0 bar Single Shower Pump as a suggested alternative. *Note The Varispeed Si is currently unavailable the below button will take you to our recommended replacement product. We recommend that all Varispeed pumps are fitted in the airing cupboard with the hot water supplied from your hot water storage cylinder. This was a replacement pump for one that had given good service for over 8 years before it failed and other than the flexible pipes which had quick fit female tails, where the old ones were quick fit male tails, that meant that the copper pipe work had to be modified to suit. Picture on site shows 4 connections so I assumed it was the right pump but it wasn't Have had to return and but locally. Shame. Fast service, good price, well packed. Service rating : Delivery fine. could have asked for alternate address of drop off point and had to rearrange delivery. Product : Picture on site shows 4 connections so I assumed it was the right pump but it wasn't Have had to return and but locally. Shame. Service rating : First class service, order was placed mid afternnon and was delivered by 8am the following morning, I wish every company gave that type of service. Product : This was a replacement pump for one that had given good service for over 8 years before it failed and other than the... Read More. Service rating : First class service, order was placed mid afternnon and was delivered by 8am the following morning, I wish every company gave that type of service. Product : This was a replacement pump for one that had given good service for over 8 years before it failed and other than the flexible pipes which had quick fit female tails, where the old ones were quick fit male tails, that meant that the copper pipe work had to be modified to suit.